Warning: all charts from this website are NOT FOR NAVIGATION. 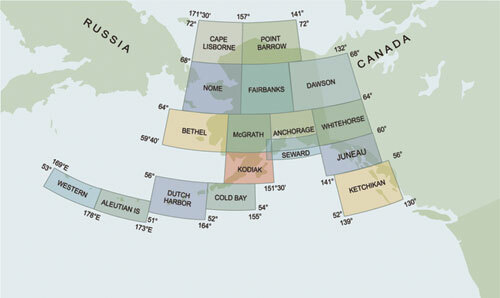 Alaska has a grid system that necessarily differs from the lower 48. The Alaskan Numbered Grid System provides a standard systematic method of assigning search areas, provides close coordination between participating units, and simplifies record tabulation at the close of search operations. The Alaskan Numbered Grid System that remains in use in the Alaskan Theater was originally established using the "World Aeronautical Chart" (WAC) charts as a base of reference. The coverage for WAC charts has changed, so the grid system does not conform to either the WAC charts nor to the sectional chart coverage for Alaska. The grid system divides the Alaskan mainland, a portion of the Aleutian Chain, and Southeast Alaska into 15 major areas. The 15 areas are numbered sequentially from left to right, top to bottom. Thus, Roman numeral I is in the Northwest corner of the state through Roman numeral XV in the Southeastern portion of Alaska. With some forethought, this system can be adapted to any navigational chart that has latitude and longitude depicted. Each major area's boundaries are depicted in the table below. Here is the old pamphlet that explains the Alaska grids; the information on this site was based largely upon it. As trivia, WAC charts are updated annually except for a few in Alaska, Mexico, and the Caribbean, which are revised bi-ennially. Please note that the grid charts available for download via this site are never updated and are therefore not suitable for navigation. In the Alaska grid system, each of the fifteen major areas is overlayed with a grid specified at 30 minutes of latitude and each degree (60 minutes) of longitude. Each minute of longitude is a relatively short distance at Alaskan high latitudes. A minute of latitude is always equal to one nautical mile, whereas a minute of longitude gets progressively smaller as a function of latitude. In fact, one minute of longitude as expressed in nautical miles is equal to the cosine of the latitude. In any case, 60 minutes of longitude by 30 minutes of latitude make up a manageable search grid or "block" in Alaska vernacular. Starting in the Northwest corner of the major area described by the Roman numeral, each block is numbered one, two, etc. from left to right and North to South consecutively to the Southeast corner of each area. Download individual major area maps below. Each numbered block / grid square is broken down into four smaller quadrants containing 15 minutes of latitude by 30 minutes of longitude. The Northwest quadrant is "A," the Northeast is "B," the Southwest is "C," and the Southeast is "D." This is in direct correlation to the subdivision systems used in the Conventional and Cell Grids as used in the lower 48. The quarter grids may be further sub-divided into sixteenth grids. That is, grid 70B could be divided into 70BA, 70BB, 70BC, 70BD. The size of each sixteenth grid is roughly comparable then to the quarter-grids (or three-letter grids in the Cell system) used in the lower 48. The area of each grid, however, is greatly dependent upon latitude. For example: Grid II-4AA is at roughly 72º North Latitude. The sixteenth-grid measures 7.5 by 4.69 NM, which is 35.2 NM2 (square nautical miles). In contrast, Grid XV-70DD, which is at roughly 52º North Latitude, measures 7.5 by 9.24 NM, which is 69.3 NM2. As one goes from the extreme northern portion of Alaska to its southern extremes, the actual grid (search) area nearly doubles. To compare to the lower 48 grid systems, consider the following. Each is a 7.5 minute grid, or a quarter grid in the conventional system or a three-letter grid in the cell grid system. As an example, the Twin Cities sectional is at the northern extreme of the lower 48 United States sectionals at approximately 49º North Latitude. Quarter-grid MSP 23B is the same as grid 48095BAB, and measures 7.5 by 4.94 NM, which is at approximately 37 NM2. At the southern extreme of 32º North Latitude is the Brownsville sectional. The BRO 381D grid or cell grid 24097CCD measures 7.5 by 7.02 NM, which equals 52.7 NM2. All of the grids used in these examples are manageable search areas so long as consideration is given to the actual area being searched. To construct the Alaska grid on any navigational chart, sectional, TPC, etc., first determine where the corners of the respective area would fall on the chart in use. Annotate the search chart with the corresponding grid. When a search extends beyond an area annotate adjacent areas as demonstrated in the sample mission chart. Search area assignment will be assigned to individual search aircraft in the following manner. Example: "CPF 5025, search area XIII, block 65 Delta." Utilizing the McGrath sectional this block would represent a 15 mile square area bounded by coordinates N61º 15' W155º 30', N61º 15' W155º, N61º W155º, N61º W155º 30'. 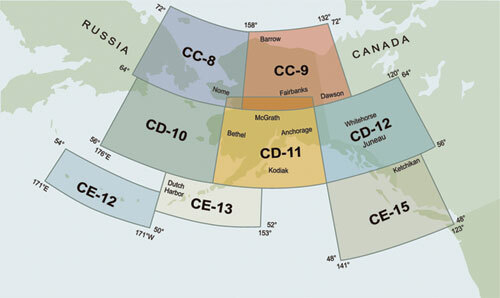 All military SAR and CAP corporate aircraft in Alaska are required to maintain a copy of this grid information within the respective aircraft to aid in determining and assigning search areas. Each of the links below will take you to a .pdf file for the respective areas. Warning: EACH CHART IS APPROXIMATELY 15-25 MEGABYTES! This will take an extremely long time to download on a dialup connection (a half hour or longer). The charts contain high-resolution sectional graphics for the best quality, not for small file size. You are able to zoom as high as 300% before pixelation. Warning: all charts from this website are NOT FOR NAVIGATION.